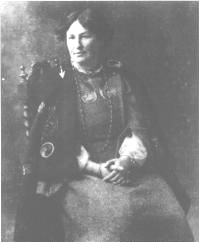 Charlotte Grace O’Brien was born 23 November 1845 in Cahirmoyle, County Limerick. Her father, William Smith O’Brien, took part in the aborted rising of 1848 for which he was exiled to Tasmania when Charlotte was 9-years old. Charlotte’s mother died when she was 16 and the 19-year-old Charlotte went to live with her brother, Edward and his wife, Mary. Following Mary’s death in 1868, Charlotte remained with Edward to raise his three children, then aged 4, 3 and 2-years old. In 1870 she found her voice as a writer. Her first book was Dominick’s Trials: An Irish Story, but her 1878 novel about the Fenians, Light and Shade, was more widely known. She wrote poems and a play, as well as Charlotte’s Children stories and other contributions to periodicals like The Nation, United Ireland, Limerick Field Club Journal, Dublin University Review and the Irish Monthly. A hereditary hearing impairment plagued the O’Briens and by 1879, Charlotte, who had been hard of hearing since childhood, became entirely deaf. Her brother, Edward, remarried and she was on her own. Her nephew, Stephen Gwynn, published a memoir of her in 1909, in which he notes the turning point that 1880 marked in Charlotte’s life: ‘Now at the age of thirty-four, she had to shape her own life’ and she shaped it to help others. Emigration drew her to that issue after she read: The Irish in America by J.F. McGuire and she declared, ‘I was deeply impressed by his account of the ships and it took hold of my mind, that was to be my work’. She visited the Queenstown embarkation point for many emigrants and in March 1881, toured the emigrant ship Germanic. She later wrote: I was not prepared for the way I saw all sexes and ages huddled together . . . I got into the fight; tumbled into it, I may say. O’Brien wrote: Having been at the work more than a year, I saw clearly that no permanent good could be done in Ireland and that New York was to be my next point’. Later, she wrote of her first visit to the New York tenements in 1882: When I arrived, instead of going to a hotel or fashionable boarding house, I took a room in a tenement house in Washington Street. I spent some time there with a porter, a longshoreman and their wives. A month spent in New York gave me a full insight into the lives of the Irish emigrants and the fate of the innumerable unprotected girls who were swarming through my own hands in Queenstown. She told an interviewer: I have not seen one child that we would call perfectly healthy. As to your tenement house system, it seems to me to be as miserable a system as it is possible to conceive. I did not happen to visit a single family that had not lost most of the children it had ever had. One does not wonder when one sees the sleeping rooms, with their poisonous atmosphere, all opening into one common apartment. To combat the miserable conditions, she contacted Archbishop Ireland to set up an information bureau at Castle Garden for immigrants and convinced NY Cardinal John McCloskey to provide a chaplain for arriving Irish girls. Girls needing accommodation were placed in a Home for Immigrant Girls set up at 7 Broadway. On 1 January 1884, it became The Mission of Our Lady of the Rosary for the Protection of Irish Immigrant Girls. Then in 1885, Charlotte bought the Watson House for the Mission. Rev. Riordan was its first Director and when he died of pneumonia in December 1887, he was followed by Rev. Hugh Kelly as Director, who was succeeded by Rev. Michael Callaghan. By 1 July 1899, 476,149 Irish people landed in New York, of which 249,995 were women; many were guided to the Mission. The Mission persuaded ship lines to better safeguard their immigrant passengers and helped arrivals intending to proceed to another destination. Over the years, it provided a home for 70,000 girls whose friends did not show up to meet them, who had no one expecting them or who were unable to proceed on their journey. It helped locate relatives of those with an incomplete address and examined the fitness of those who called for the immigrant girls. It also secured positions for more than 12,000 young women, mostly in domestic service. The mission was able to continue the advocacy work of Charlotte Grace O’Brien, even when O’Brien’s failing health curtailed her own involvement. Poor health, and her profound deafness caused her to return to Ireland in 1883. She retired from active work in 1886, moving to Ardanoir, Foynes, on the Shannon Estuary. She joined the Roman Catholic Church in 1887 and her generous heart failed her on 3 June 1909; she was buried at Knockpatrick. By then her humanitarian determination had inspired others. Women helping each other occurred in every step of the emigration process, from O’Brien’s philanthropic efforts to young servants who sent passage money to sisters, cousins or neighbors at home. Any understanding of Irishwomen’s emigration must include the tragedy, the survival and the commitment to unity which make up the drama; and it must remember Charlotte Grace O’Brien and the thousands of young women whose passage she eased and who, in turn, shaped America.